More than 30 people have been killed in Yemen after a suspected suicide bomber has struck a village in the southern province of Abyan. Dozens more were wounded in the attack on a funeral service in the city of Jaar, Yemeni officials said. Military officials told Associated Press the funeral was for a man linked to militias which had helped the army in their fight against al-Qaeda. They said five suspected al-Qaeda militants had been killed earlier in the day. The men were killed in a suspected US drone strike on their vehicle in Hadramawt province. Local governor Jamal al-Aqal said in a statement that an investigation had been opened into the “criminal and cowardly” attack on the funeral service. A witness told the AFP news agency that “the suicide bomber belonged to the al-Qaeda network”. 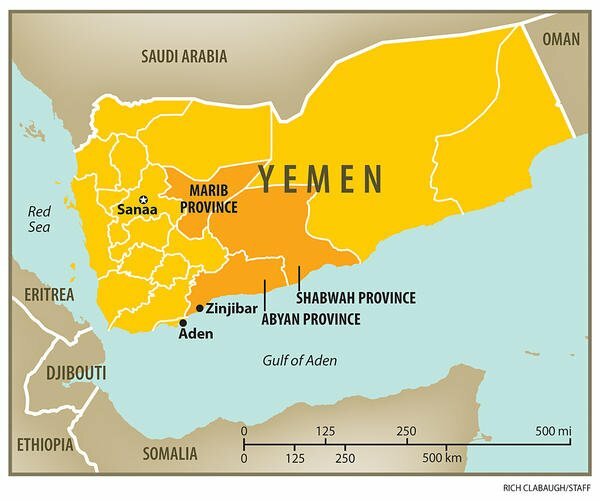 The Yemeni army carried out a major offensive against Islamist militants in Abyan earlier this year, taking control of the region in June with the help of civilian militias comprised of local tribesmen. Separatist unrest and al-Qaeda-linked militants such as Ansar al-Sharia have plagued the south for years.